Lately we have been hearing a lot about being being hacked and user data being released. 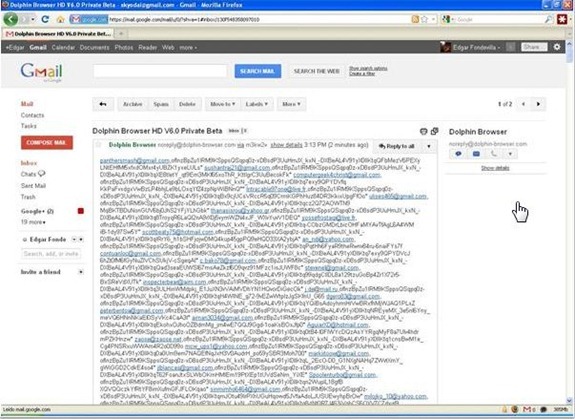 Well, Dolphin Browser has taken it to a new level by leaking user emails themselves. Dolphin Browser is a very popular browser for Android. In emails sent out to the private beta testers of Dolphin Browser 6, they have included the email addresses of everyone who have signed up for the beta. According to those who have received the email, the number of email addresses included in the email numbers in the thousands. So, if you have signed up for the beta of Dolphin Browser 6, thousands of other people who have also signed up for the same probably have your email address as well. Just great!! At a time when online privacy is becoming a very important thing, this is a very huge goof up from Dolphin Browser. We have reached out to Dolphin Browser for comments. Here are some of the tweets from those who have received the email. Thanks to everyone who sent in the tip.